We have heard of many sports persons, visitors to Europe, UK, Canada or USA ‘disappearing’; only to surface years later with a foreign citizenship. But we had never heard of beggars being smuggled out of India . Well there is always a first time. Hope they do not land up in Pakistan or Afgan Taliban training camps. Mumbai: As many as 166 pilgrims, who went to Saudi Arabia on pretext of Haj, are missing. These 166 are suspected to be Indian beggars who go to the holy city for begging in the guise of Haj pilgrims. Their mastermind, Sharful Haque, a resident of West Bengal, was arrested earlier by the Kolkata police. The disappearance was reported to the Central Haj Committee of India when the 166 pilgrims did not report to the airport in Jeddah. “They are suspected to be beggars and part of a huge racket,” said Dr Shakir Husain, chief executive officer of the Central Haj Committee. He added there was no information about the whereabouts of the 166 pilgrims who belonged to Murshidabad in West Bengal. “We have written to the head of the West Bengal Haj Committee, asking about the approval of these beggars’ applications. Our office has informed the chief secretary of West Bengal,” added Husain. Sources said the doctors who issued medical certificates to such beggars could be grilled during the police probe. An inquiry has begun in the Haj Committee of India. Husain said these beggars go do not even stay in the quarters allotted to Haj pilgrims in Mecca and Madinah. “It was the duty of the State Haj Committee to identify such people and stop them,” said Husain. Three months ago, the Haj Committee officials found at least a dozen people who had used different photographs on the passports but their names were the same on the previous passports. Some of them had new passport numbers as well. “When a few beggars were detained in Saudi Arabia, they spilled the beans about the racket and mastermind Haque. The Council General passed on this information to the Haj Committee and Haque was arrested in Kolkata while trying to board a flight,” said sources. 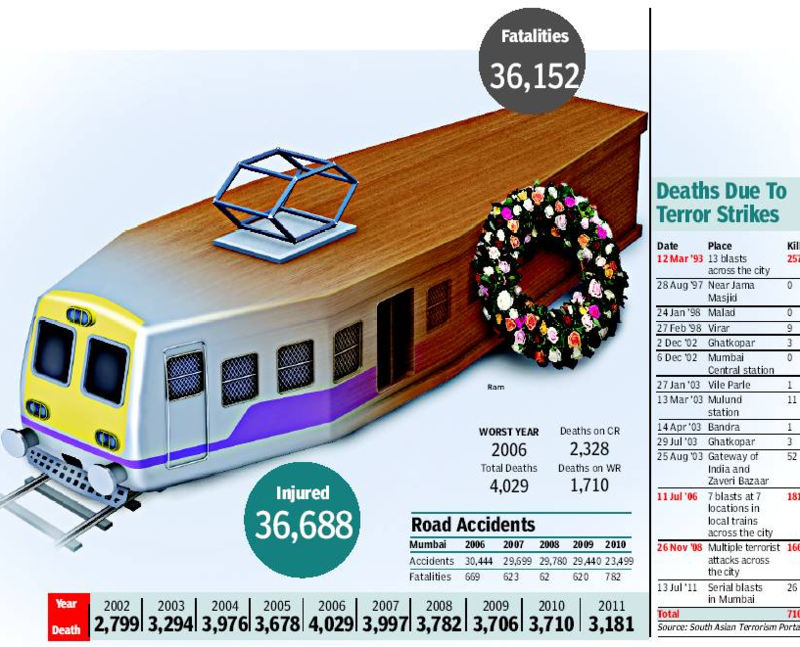 Deaths due to rail and road accidents in the city are much higher than those caused by terror attacks. A query filed under the Right to Information (RTI) act has revealed that the death toll on rail tracks hovers around 3,700 since 2006. But the worst years for railway commuters were 2006 and 2007, during which the number of deaths registered under various circumstances touched 4,029 and 3,997 respectively. Since 2002, stretches falling under Kurla Government Railway Police recorded 3,360 deaths due to trespassing. Likewise, on Western Railway, stretches under Borivli GRP topped the chart with 3,334 deaths. The RTI, filed by activist Chetan Kothari, revealed trespassing-related deaths were highest in 2004 in which 2,734 people died, including 1,495 on CR alone. In fact trespassing was the largest killer, causing 23,820 fatalities since 2002. On WR, these types of deaths are registered primarily in crowded stretches of Borivli GRP, which includes stations from Dahisar and Goregaon and Vasai GRP whose jurisdiction is between Mira Road and Virar. Deaths after being hit by a pole reduced drastically in 10 years. Kothari said, “In 2002, 96 people died after dashing against a pole from a moving train. This figure has fallen to 19 in 2011.” Likewise, deaths due to falling into the gap between the platform and train reduced drastically. “In 2003, 46 people died, this has become single-digit since 2006,” he said. Road accidents too are a cause for concern, experts said. “Mumbai should follow the road discipline of London, New York and Singapore. Here, motorcycle-borne youngsters and those in SUVs break signals with impunity and cause accidents. In foreign cities, there is invisible patrolling through CCTV cameras, which is yet to take off in a big way in Mumbai,” said traffic expert and activist A V Shenoy. Consumer Protection : Who Cares? India was the first country to enact the Consumer Protection Act (CPA). This historic legislation received the President of India’s assent on December 24, 1986. The enactment will complete 25 years this year. To celebrate the silver jubilee of this enactment, the department of consumer affairs (DCA), Government of India, in collaboration with the Indian Institute of Public Administration (IIPA), had announced that a commemorative national seminar would be held for two days on December 22 and 23. The theme of the seminar was “Consumer Protection In India: The Way Forward”. It was made clear that those consumer activists and voluntary consumer organizations who wished to participate would have to make their own arrangements for travel and stay in Delhi and bear the expenses for attending the seminar. The deadlines for the event were fixed. Registration form for participation would have to be submitted by August 31. Intimation of acceptance of participation would be communicated by September 30. Confirmation of participation was communicated via email on October 10. The e-mail stated that the detailed programme of the seminar would be intimated in the first week of November. Several activists across the country made their travel and stay arrangements. As no further communication was received, telephonic inquires were made. Activists were informed that the person who would inaugurate the seminar was yet to be finalized and thereafter the detailed programme would be e-mailed. Now, with barely ten days to go for the seminar, consumer activists made frantic calls to the IIPA, only to be told that the DCA is yet to confirm who would inaugurate the seminar. Rajiv Agarwal, secretary in the DCA, when contacted, claimed he was unaware of the details and directed the activists to G N Sreekumaran, joint secretary. The facts which emerged were that the President of India had been approached to inaugurate the seminar. She took a month and a half to intimate that she would be unable to do so. The Prime Minster was then approached, who took a month to intimate that he too would not be able to inaugurate the seminar. At present, the finance minister had been approached, who has not responded so far. Ahmedabad: Three senior government officials — state development commissioner, district development officer and a gram panchayat secretary — may not get their December salaries as per a Gujarat high court order. Hearing a petition filed by Rasikbhai Ramji Valodara, a sanitary worker with Chuda gram panchayat in Surendranagar, Justice Anant Dave made the oral order. Valodara has accused in his petition that he, along with three other workers, has been deprived of salary despite him being a permanent employee with the panchayat. He said in his petition that despite working with the panchayat for the last 30 years, they are not given benefits of permanent employees and paid a meager Rs 1,800 monthly salary. Valodara has accused that even the Rs 1,800 was not paid regularly and he last received his salary before Diwali. Ruling in favour of the workers, the court ordered that ‘if monthly salary of the petitioners, if due as on date, is not released in regular course, the secretary, Department of Panchayat, state of Gujarat, after issuing notice, shall withhold the salary of the development commissioner, district development officer and the secretary of gram panchayat, henceforth.’ Further hearing in the case has been slated for December 29. “The workers have been fighting for their rights since 1999 when a labour court ruled in their favour asking the state government to take them as permanent employees. However, that never happened and they moved a petition in high court last year seeking benefits as permanent employees. A proposal to extend the benefits was sent to development commissioner after the petition which was turned down,” said advocate N D Songara, who filed the petition for the workers. Neelub’s Cartoons are always lively, and a nice way to start a day with. I wonder how he does it. Even the expression on the faces, the details. Most appropriate for the TOI Head Line.